Justice for Baby ! PLEASE TAKE ACTION ! ! N'd and Signed #1,355, Thanks Cher. that poor baby is scared to death!!!!! how awful!!!!!! signed, thanks for posting. Poor dog! Signed and noted. Poor baby needs and deserves advocates to argue on her behalf. NOTED. SIGNED MARCH 3RD. I'M A BIT APPALLED BY THE ASPCA'S LACK O FOLLOW THROUGH ON THIS. I NEED TO HEAR THEIR SIDE OF THE STORY. I'VE BEEN DONATING TO THEM FOR YEARS. signed yesterday; cannot believe this poor Puppy is a Samoyed... Tnx Cher. Reading the information on the link: http://www.justiceforbaby.org/ and seeying pictures of how a perfectly healthy Samoyed breed dog shoulkd look like, it is very, very obvious for the fullest 100% that poor Baby is neglected in the worst possible way! This poor Baby should NEVER be returned to the miserable scum who put her in this terrible condition! Question: When this was done to a child, a baby, would you send the child back to the parents who did this to the child?.... It is unacceptable that organizations who claims to "protect" animals are giving back animals to their "coward owners", when their "owners" are putting their animals in this horrible condition. Noted, signed and shared on facebook too. I have noted, signed, and had a comment. Such a shame to see what happens in the world that I'm not surprised by anything now! Signed and noted!! Poor girl!! Thanks Cher! Thank you - signed... # 1801. SN. Precious Baby does not even resemble her own breed due to the neglect and abuse suffered. 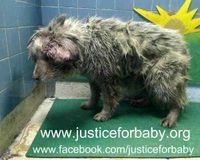 ASPCA we want answers and to know that Baby is being given proper care. Signed& will put on facebook. This is way beyond sad. That poor dog. I am so angry with her owners. Poor Baby .... this is so sad! Signed. Thanks Cher! unbelievable! what were they thinking? singed and noted... I hope she is rescued before its too late. Were they blind or just indifferent? Look at my pictures of Paige, that i s what a Samoyed is supposed to look like. I would like to know what prompted the decision by the ASPCA. Normally they do not shy away from abuse cases. Does anyone know what the circumstances were behind their decision? Poor baby, not only should the owners ne head accountable. I don't understand how any one can be so cruel. Signed, noted and forwarded to FB. Thanks. Signed.What is wrong with the Aspca?They are not doing their job. Thank you Cher for sharing and caring. Action taken and noted! Take care of all animals! They deserve a good life!! I proudly signed for Baby! Poor thing needs a good loving family.I hope someone will step up and be a angel. #2115 so signed! Thank you Cher! This is so unconscionable and shameful, i have no words for the irresponsibility -- is anyone thinking of the dog for the benefit of the dog?